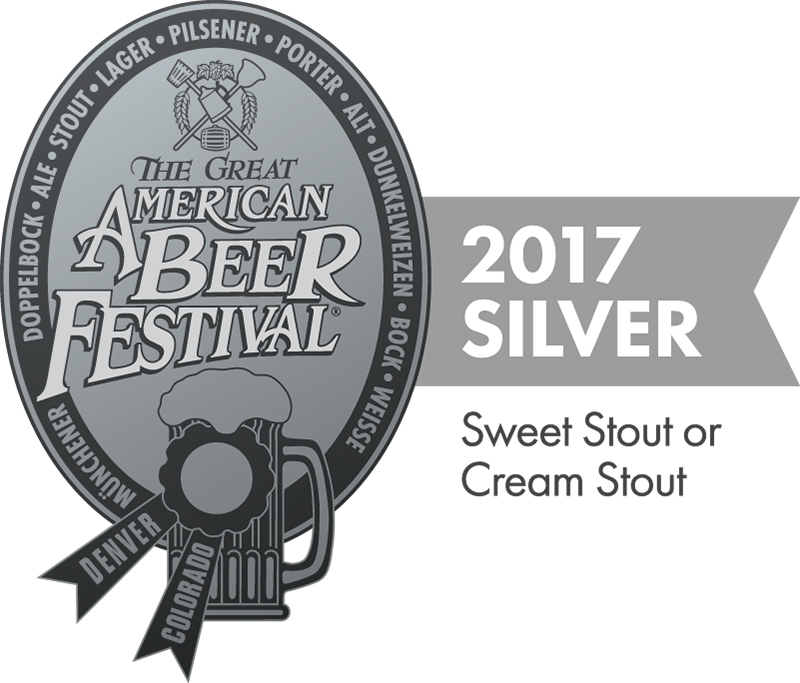 St. Petersburg, FL • October 9th, 2017 — Pinellas Ale Works received a silver medal at the 2017 Great American Beer Festival (GABF) competition. Presented by the Brewers Association, GABF is the largest commercial beer competition in the world and recognizes the most outstanding beers produced in the United States. The top three winners in the competition’s 98 beer-style categories were announced October 7 at the Great American Beer Festival awards ceremony held at the Colorado Convention Center in Denver, Colorado. 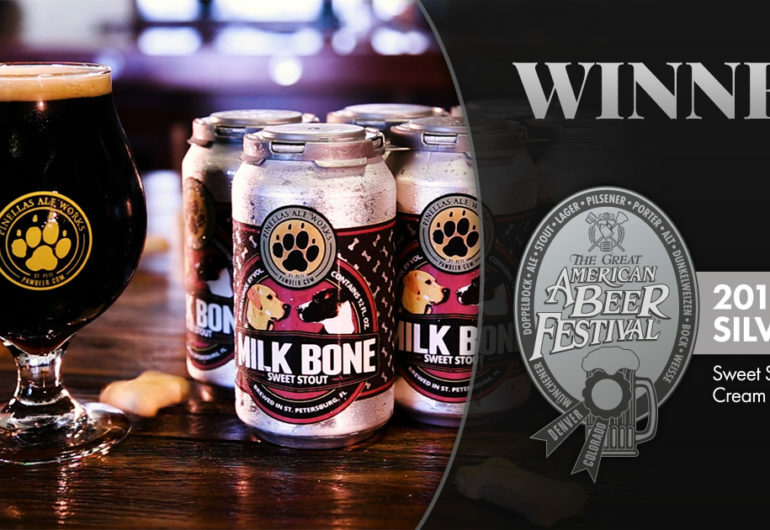 Pinellas Ale Works was recognized in the Sweet Stout or Cream Stout beer-style category for its “Milk Bone Sweet Stout”, a full-bodied milk stout with subtle notes of roasted barley, coffee, and milk chocolate. 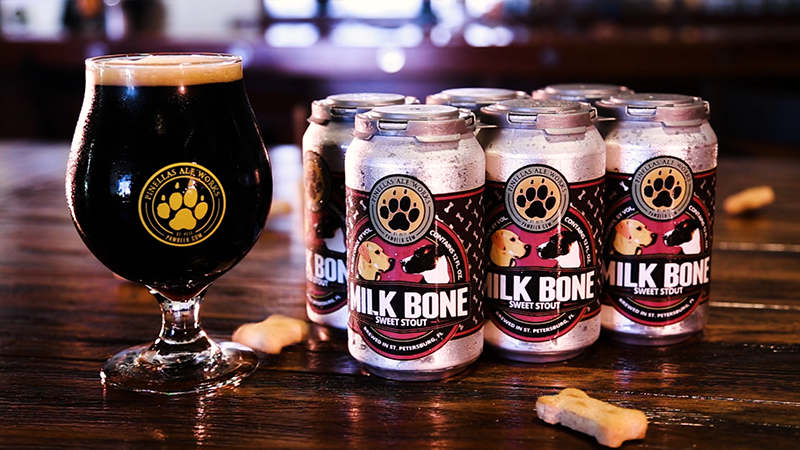 “Milk Bone Sweet Stout” pint and 6-pack on display at Pinellas Ale Works. Founded by brewers Dennis Decker and Matthew Brown, Pinellas Ale Works has worked many years testing and refining their recipe for “Milk Bone Sweet Stout.” Inspired by the the team’s shared passion for dogs and great beer, they wanted to give their community a beer they could be proud of. 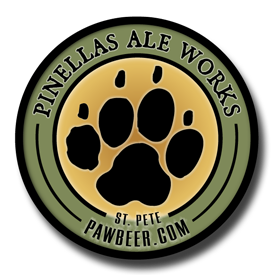 For more information about Pinellas Ale Works and their “Milk Bone Sweet Stout,” visit pawbeer.com. Interviews with Pinellas Ale Works brewers are available by contacting ian@leewardinteractive.com or by phone at (727) 300-6521. About Pinellas Ale Works: Pinellas Ale Works, “PAW” for short, opened in 2016 in the Grand Central district of St. Petersburg, Florida. The 15-barrel microbrewery was started by Matthew Brown and Dennis Decker. The two’s inspiration for their beers comes from their dogs and their city. They do this to give their patrons a great beer experience, and to give their city a brewery that they can be proud to call their own. The “Milk Bone Sweet Stout” beer won this medal. Next Post: “1888” Wins at the 2018 Best Florida Beer Competition!